The Reef World Foundation proclaims 2018 as the International Year of the Reef. And that couldn’t have come at a more appropriate time. Today, our coral reefs—the precious rainforests of the oceans—need our help. Years of negligence, over harvesting of marine resources, global warming—all these factors have seriously impacted our reefs. We need to take action to save this delicate ecosystem. 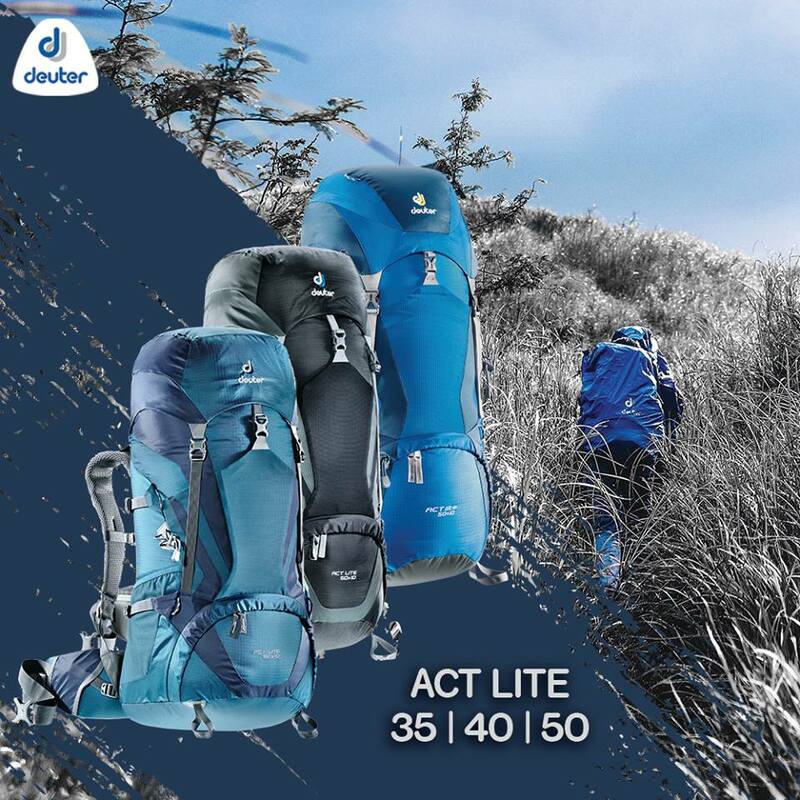 Eco-warriors of Project BLUE execute initiatives and projects to help mitigate, reduce, repair, or even reverse the harmful environmental effects of human activity and greed. 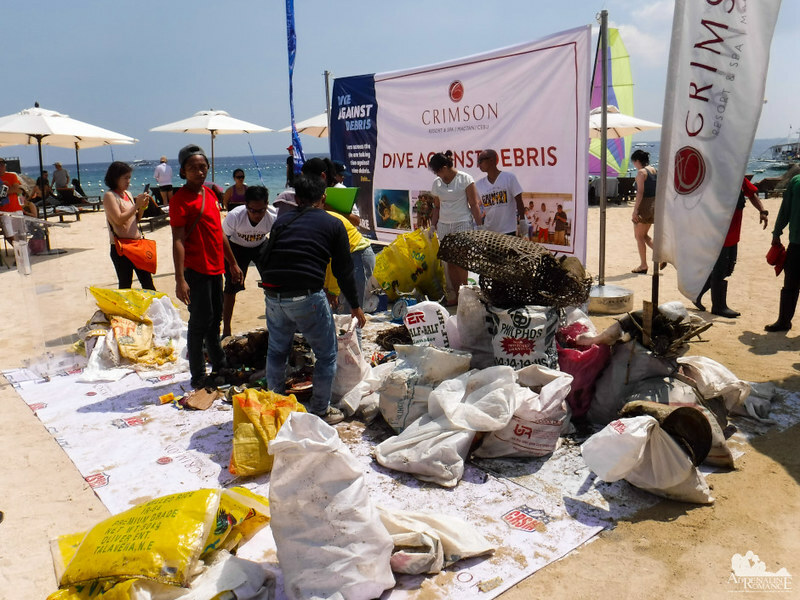 This year, we joined them in the Dive Against Debris annual reef cleanup. The Project BLUE team enjoyed a huge hot buffet breakfast early in the morning courtesy of Bluewater Maribago Beach Resort. Satisfied and full, we later headed over to our boat and loaded up our scuba gear. 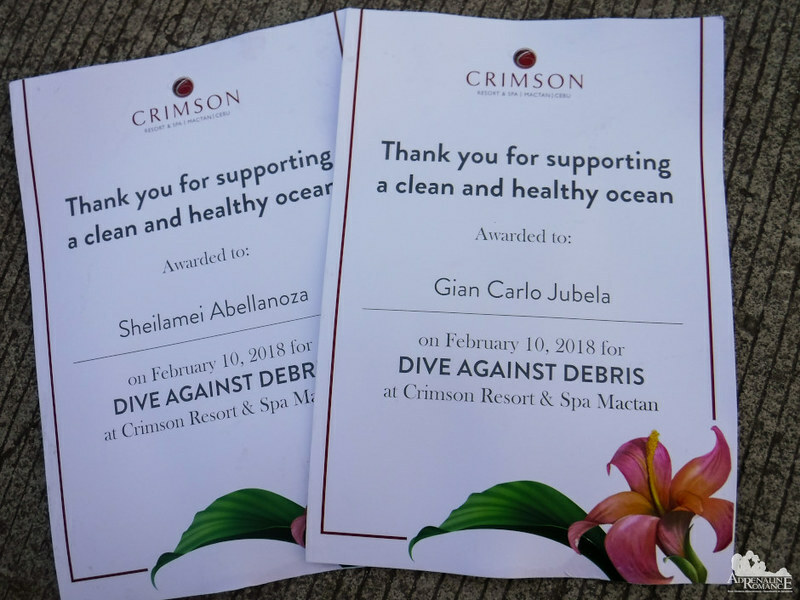 Before doing the reef cleanup, we first went to Crimson Resort and Spa, the sponsor for the Dive Against Debris event, to register and listen to the dive briefs. We’ve been living in Mactan Island all our lives, but we never get tired of its dazzling coastal scene. We also know that below that aquamarine water are beautiful reefs that are just waiting to be visited. A short time later, we arrived at Crimson Resort and Spa. “Punctuality is the politeness of all princes,” according to Prince Kit in the movie Cinderella. We were among the first divers here. We found ourselves a nice spot where we can dock our boat. It was still around 7 AM, and the sun was still low on the horizon, but there were already a growing number of divers registering for the cleanup. It’s really heartwarming to see a lot of people take action in whatever way they can to preserve our marine environment. 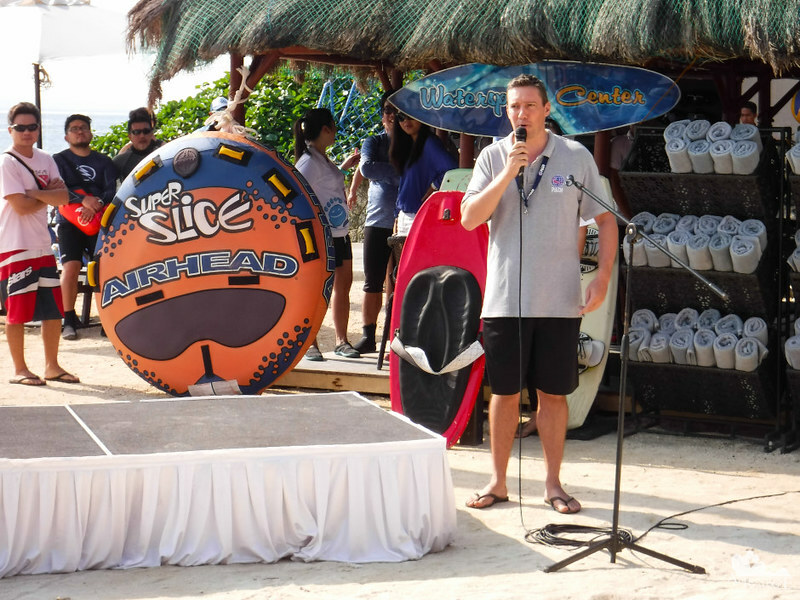 After a short introduction from Crimson’s general manager, their dive instructor initiated the briefing. 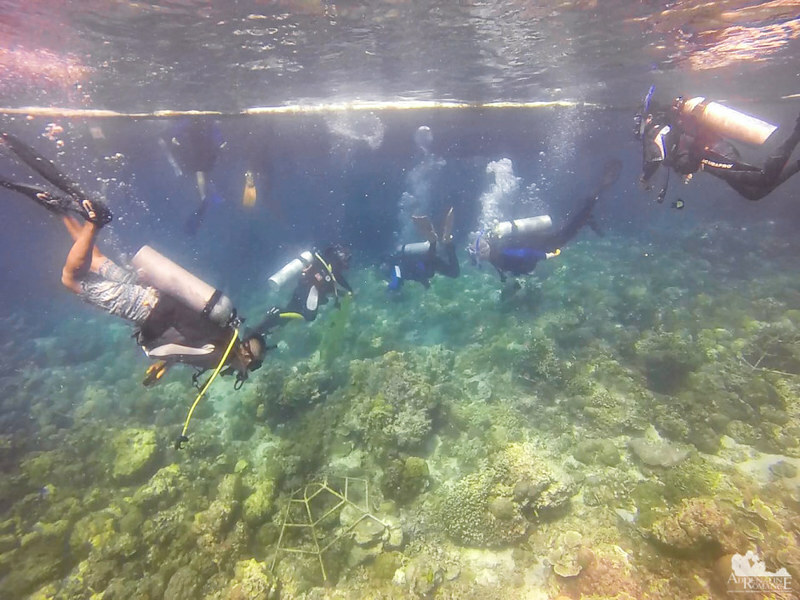 Those entering the water from the shore will clean the resort’s in-house reef. Those who came in boats will scour the nearby coastline. 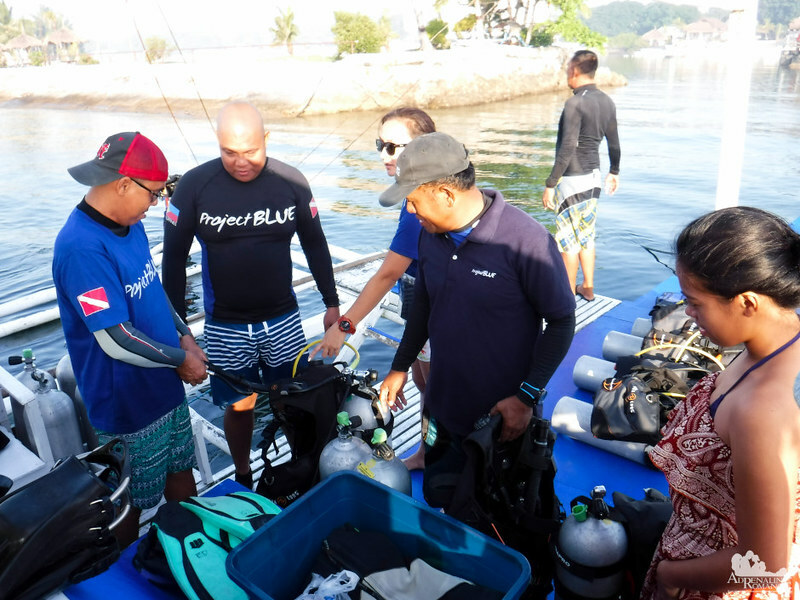 Project BLUE’s assignment was on a section of a reef between Kontiki Dive Resort and Bluewater Maribago. Considering that this is somewhat an informal but common tourist port, there’s a high concentration of pumpboats here. Thus, we were expecting to extract a lot of garbage here. 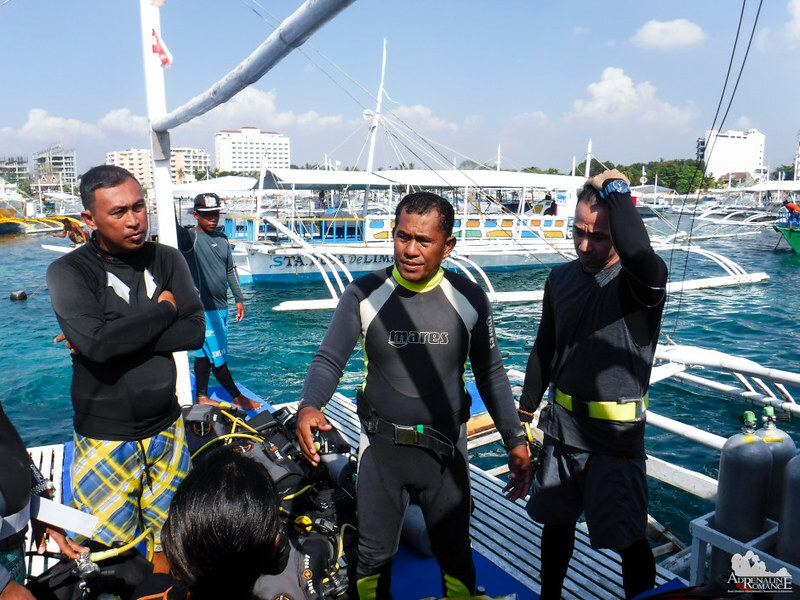 During our last MyBluEarth reef cleanup, we emphasized to fishermen, boatmen, divers, and locals the importance of observing environmentally sustainable boating and tourism practices. Let’s see if they heeded our advice. Everyone geared up and entered the water. There was no current, so this cleanup will be quite manageable. 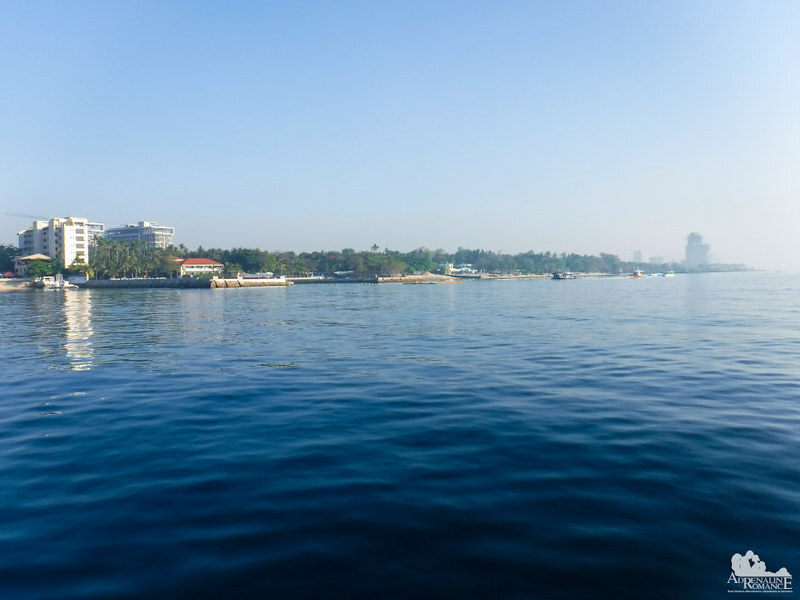 However, we need to be very careful with our position below the surface since this is a high-traffic area with lots of boats and personal watercraft cruising on the surface. 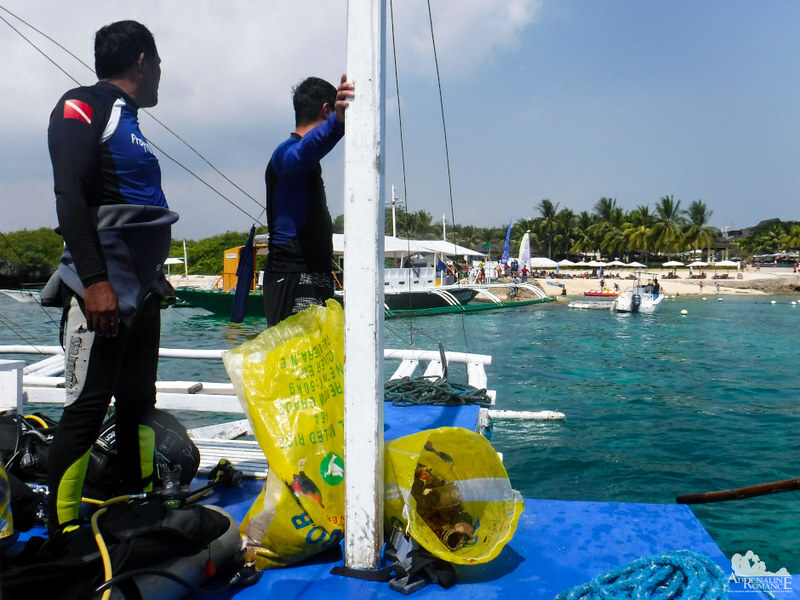 Immediately, our team went to work scouring the reef for garbage thrown by reckless tourists, boatmen, and locals. We used old rice sacks to store the trash we collected from the seabed. We were cleaning in dangerous waters. Propellers of passing boats and personal watercraft could pose a lot of danger. We found bottles, pieces of plastic bags, discarded cans, and other pieces of trash. Discarded tissue paper and wipes are probably the most difficult rubbish to handle. Wet tissue or wipes disintegrates at the slightest pressure. 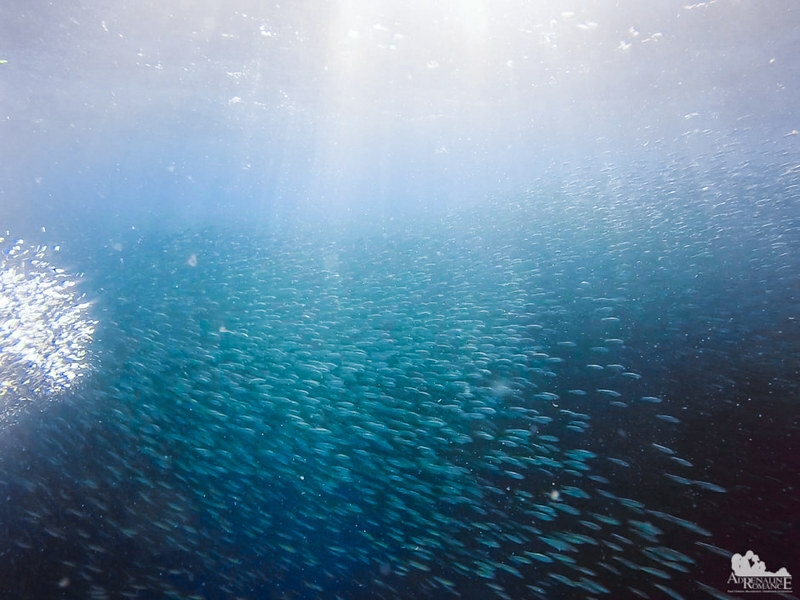 Reef fish inadvertently ingest the tiny scraps, which may cause serious complications. 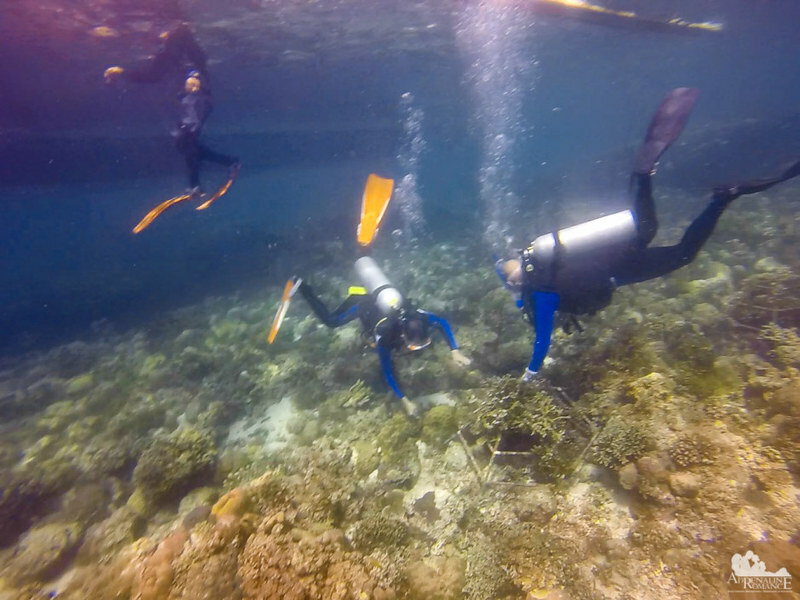 While there are splotches of healthy coral around, large areas of the reef are barren and destroyed, leaving behind rubble and lifeless husks of coral skeletons. Careless anchoring is the prime cause of destruction. After being tossed from the deck of a pumpboat, heavy anchors wreck havoc as they land or get dragged on delicate coral heads. Irresponsible divers who touch marine life and who are not mindful of their buoyancy or finning techniques also damage the reef. These concrete mooring mounts for floating buoys and diving platforms may look ugly and out of place, but they’re one of the most effective ways of protecting the reef. Rather than throwing anchors overboard and causing great damage to a reef, a boatman will simply tie up his boat to a floating buoy to stabilize his vessel. In addition, the mounts serve as foundations for corals and sponges to grow. Global warming is a serious issue. An increase of 1 or 2 degrees in ocean temperature is going to be fatal to corals in a few months; for them, it’s like having a prolonged fever. The first sign that a coral is sick is usually bleaching, that is, the coral turns white. 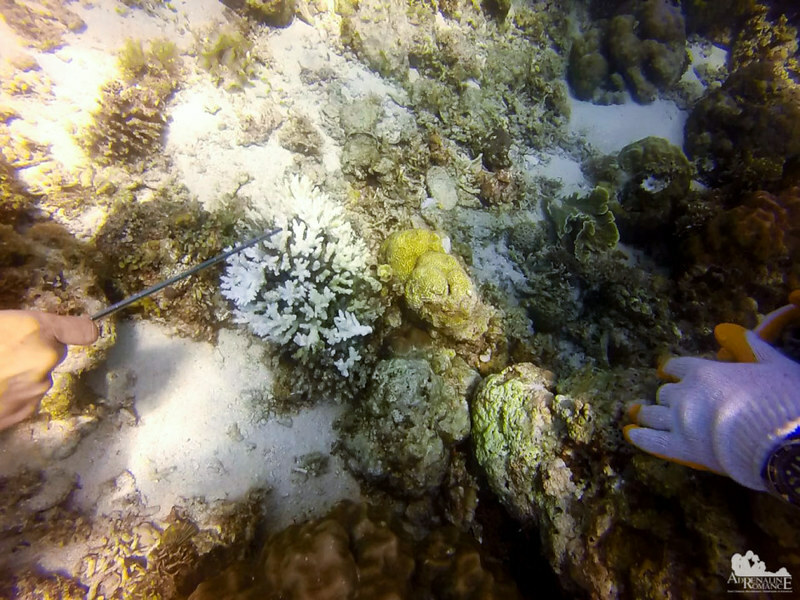 Corals start to bleach when they eject their life-giving zooxanthellae—the symbiotic photosynthetic microscopic algae that produce their food and give them their color—as a stress response to rising water temperature. The white coloration is actually the coral’s exoskeleton; the living tissue has become transparent due to the loss of the zooxanthellae. Eventually, without their food-producing zooxanthellae, the coral will starve and die. In 2017, 29% of the corals in the Great Barrier Reef of Australia died due to mass bleaching brought about by global warming. Pollution, disease, and increased ocean acidification are also some of the major factors that causes bleaching. 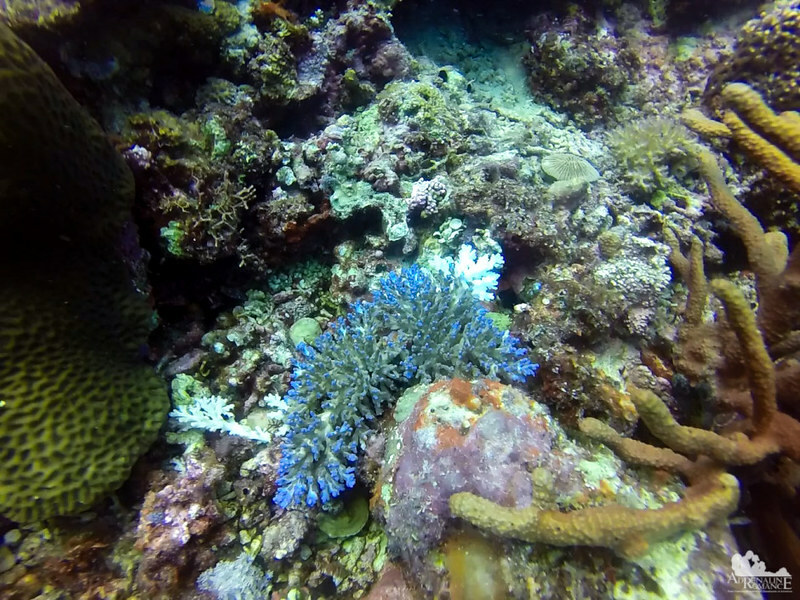 Some corals have started to become fluorescent; this one has turned blue. Fluorescing is a coral’s last chance to survive a bleaching event. The organism produces a chemical that acts as a sunscreen to protect itself from UV light and temperature. Flourescing corals are incredibly beautiful to look at. It’s a spectacle of Mother Nature. But once you know why it’s doing such a thing, you will really feel sad. 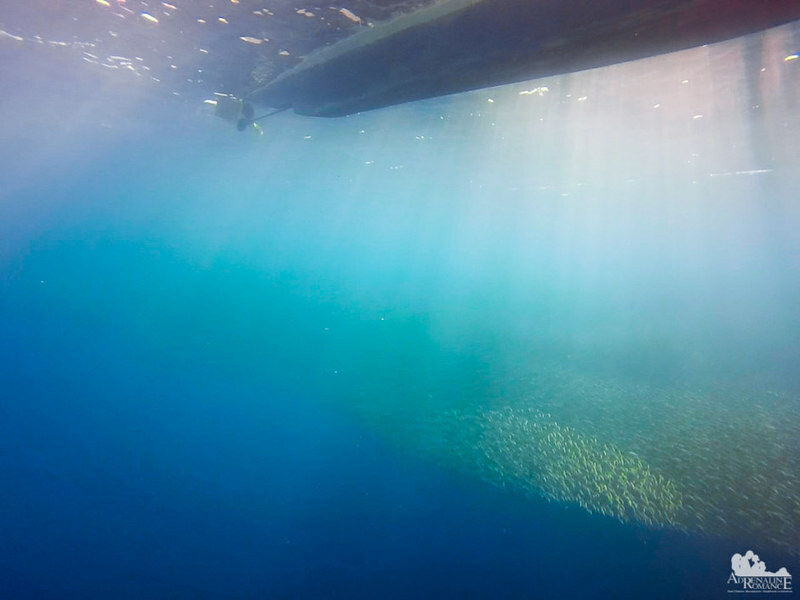 A huge school of sardines came to check us out as we cleaned the reef that they call home. What we’re doing does little to undo the damage humanity has done. But at least, in our own way, we’re doing the best we can in protecting, repairing, and nurturing the marine environment. A few years ago, Project BLUE left a few metal frames for healthy staghorn coral to grow. 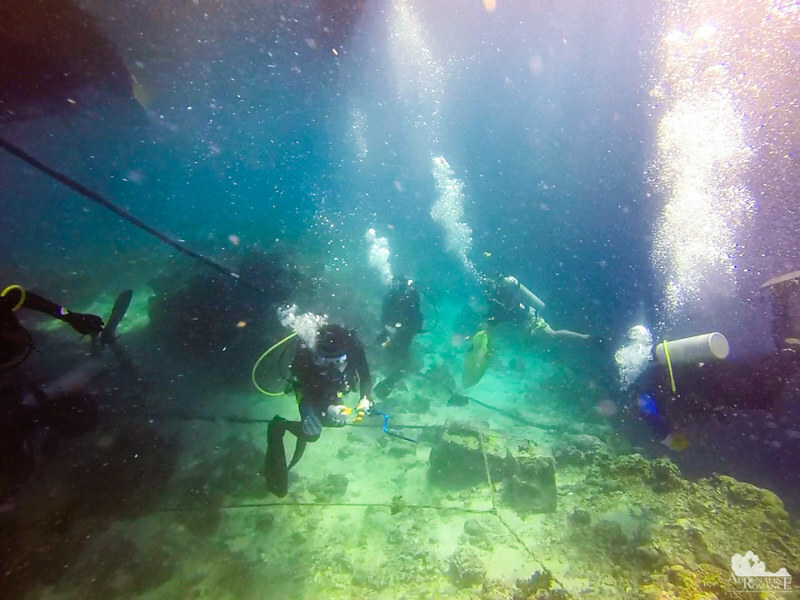 We had to do this so we could re-grow corals that were damaged by destructive anchoring. We inspected the frames so we can check the progress of the coral. As you can see, the staghorns are growing nicely! 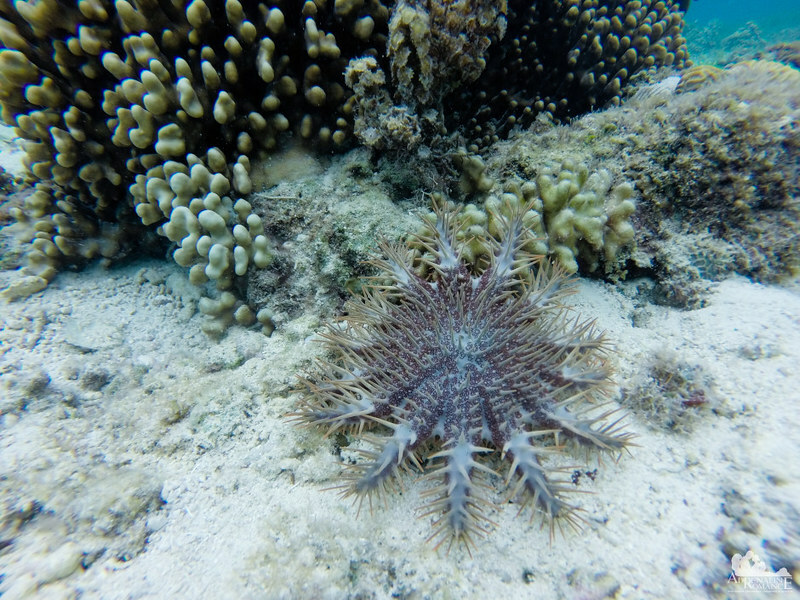 An infestation of spiky crown-of-thorns starfish also aggravated the damage to the reef. Crown-of-thorns starfish eat live coral polyps, and an infestation can destroy huge swaths of the reef. The problem is that very few animals prey on the crown-of-thorns starfish. Among its primary predators is the giant Triton’s Trumpet. However, massive numbers of tritons have been recklessly harvested for shellcraft. With no natural predators, there’s nothing to control the exploding population of the destructive starfish. This is a clear example of the effect humanity causes when he tampers with the balance of nature to satisfy his trivial greed. 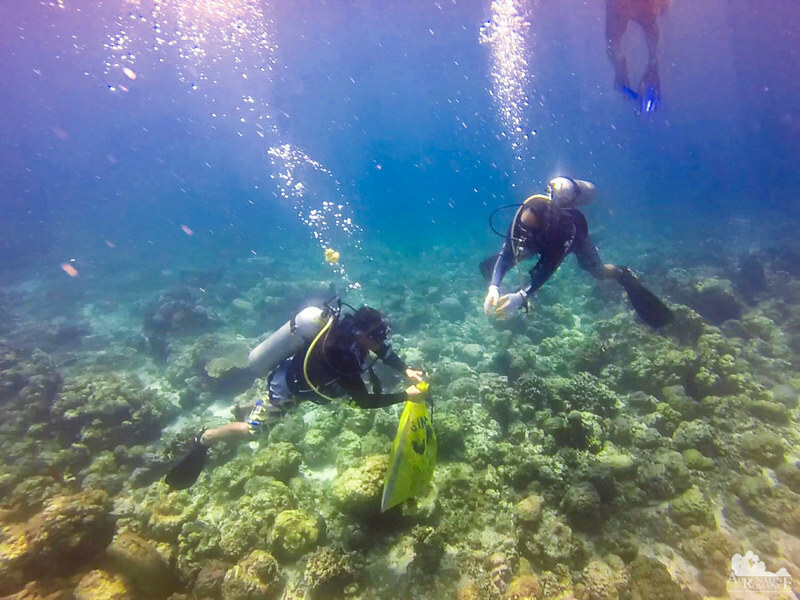 We exercised extreme care as we plucked out the dangerous starfish off the reef. Those spikes are exceptionally sharp, brittle, and venomous. 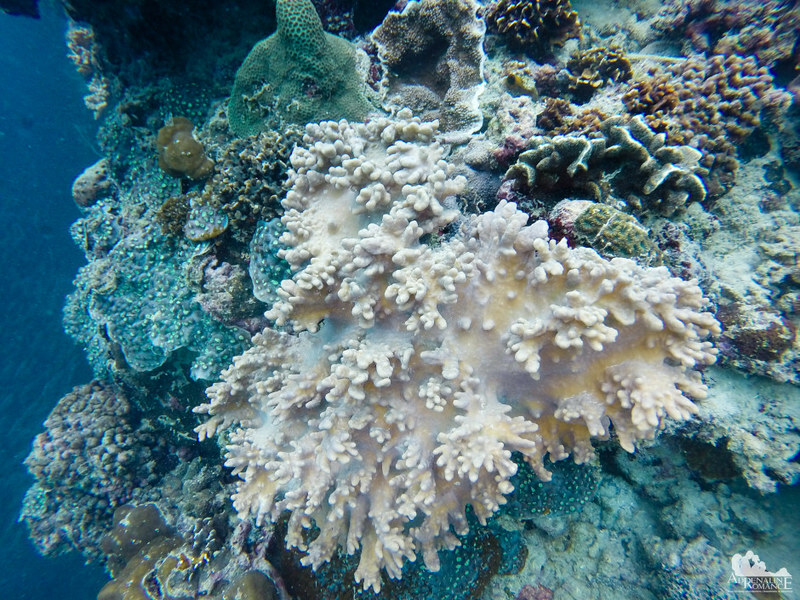 Despite the COTS infestation, reef destruction, and rubbish, there are still lots of beautiful and thriving corals particularly at the lip of the kantil. It’s a clear indication of Mother Nature’s resiliency and adaptability to a changing environment. We could only hope that we give Nature enough time to adapt to the change. Or else, we will lose this ecosystem. 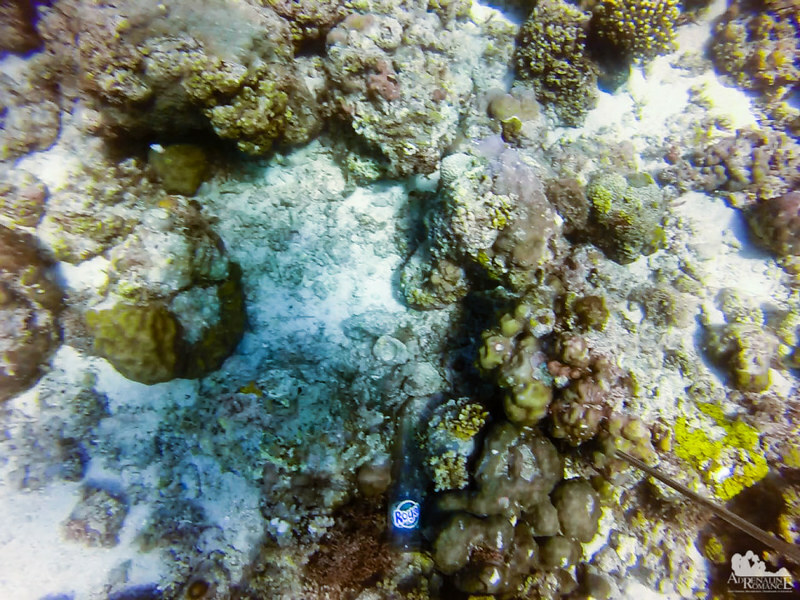 With our air getting low, we made a last scan of the reef. It will take many long years for this reef to recover. But there is definitely hope. 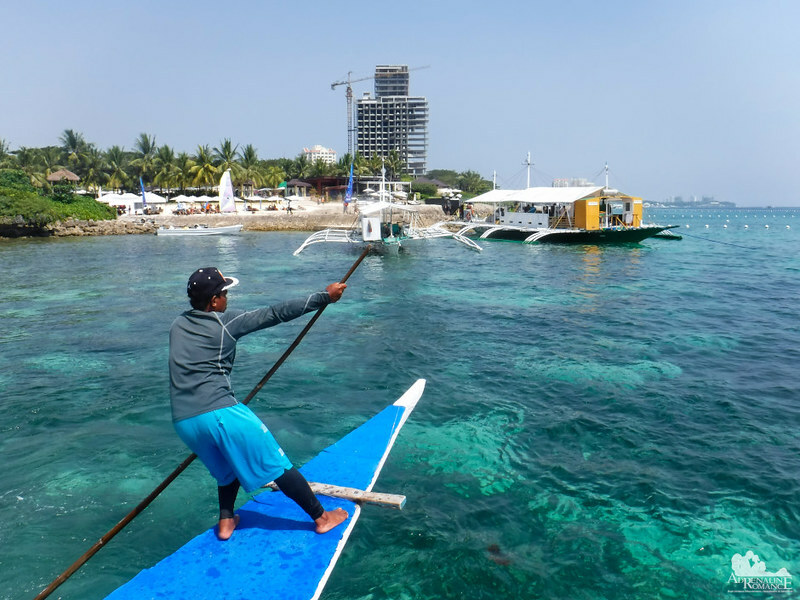 With reef cleanups, coral transplantation, observance of eco-friendly boating and diving practices, information drives, and strict implementation of environmental laws, this reef can be restored to its former glory. 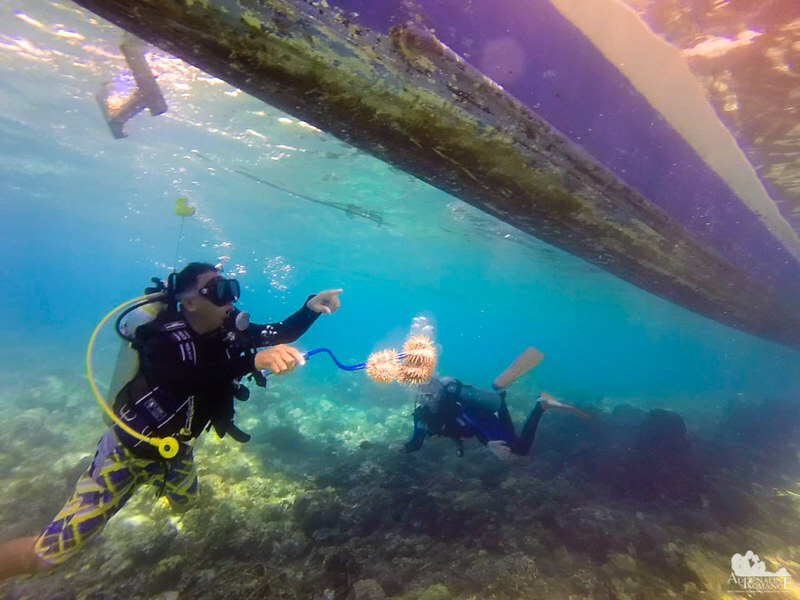 We only collected two half-filled sacks of trash even though we covered a large section of the reef. Now that is actually a good thing! That meant boatmen, locals, and dive outfitters have become more responsible for their actions. 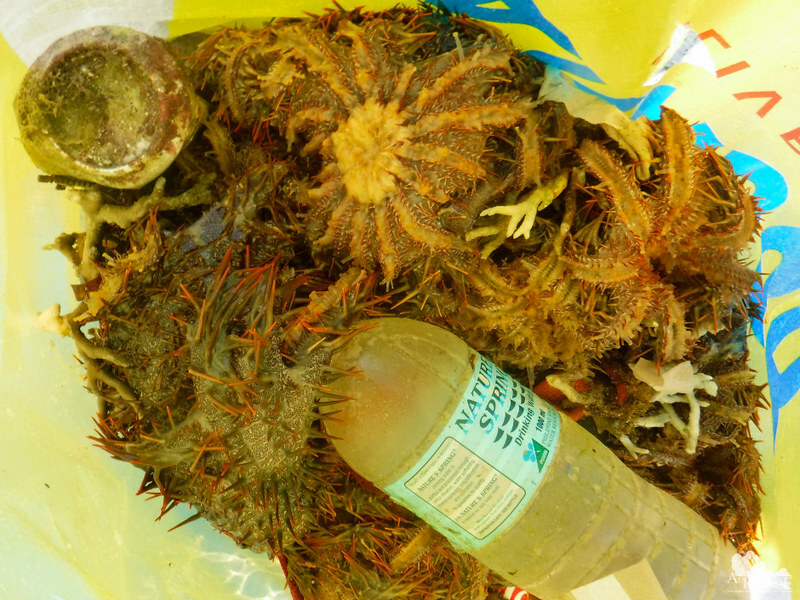 Our harvest of crown-of-thorns starfish composed most of the trash we picked from the seabed. Out of the water, the creatures began secreting a soapy slime around their bodies to protect themselves from the dry air. Just look at all those sacks of garbage! It is difficult to imagine that all those came from a small stretch of Mactan’s coastline. Our small island is surrounded by an incredible diversity of corals and marine life. 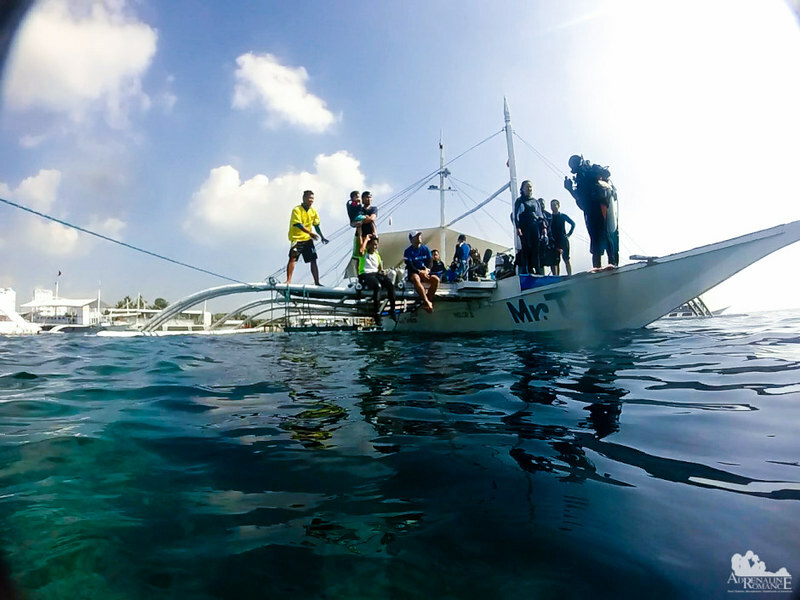 We have world-class dive sites and rich reefs that bless us with the sea’s bounties. Let us not destroy them by carelessly throwing our trash into the ocean. 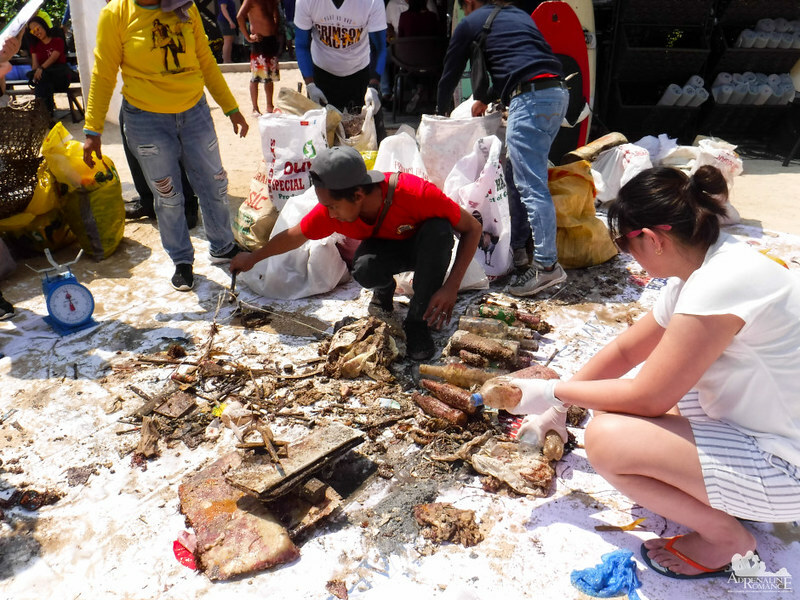 Staff from the Lapu Lapu City Government began segregating bottles, plastics, and other material after the sacks were weighted. They were especially surprised when they saw our catch of crown-of-thorns! While enjoying a terrific lunch, we met our close friend and adventurer Halourd (guy with black shirt) who also participated in the reef cleanup effort. I also came across Mario (guy in purple shirt), a personal friend of mine who is actually a marine biologist. Mario has a significant role in studying marine life as well as surveying and designating marine sanctuaries around the Cebu province. He is also the very first person who introduced me to the outdoors. We are looking forward to collaborating more projects with him. We have these cool certificates to prove our participation in this noble event! Proud scubasureros here! 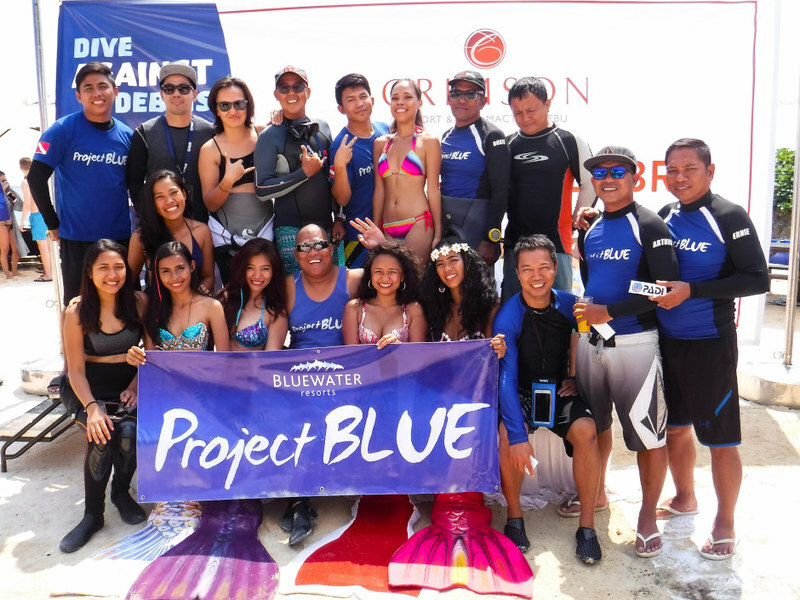 Once again, thank you very much, Eric Monstanto and Project BLUE, for inviting us to take part of the Dive Against Debris cleanup. 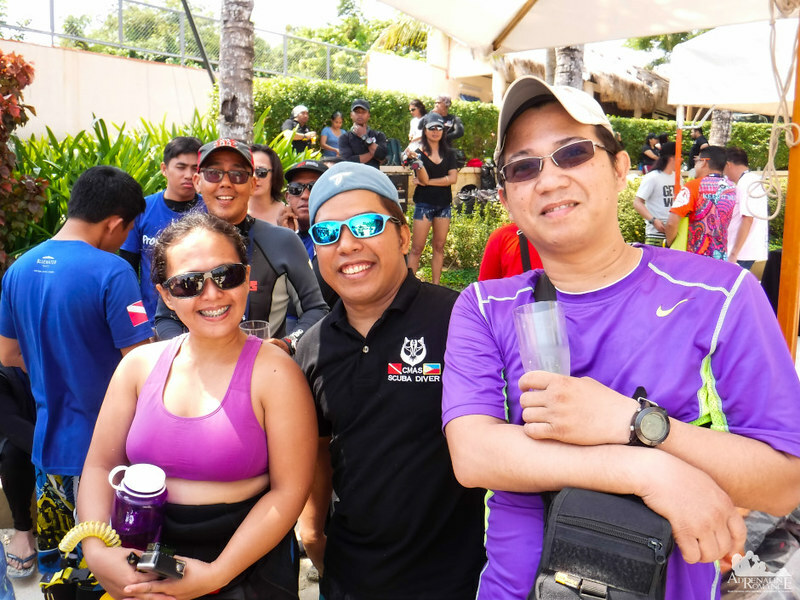 We have always been stewards and advocates of environmental protection, and through these reef cleanups, your team gave us a hands-on responsibility to take action on our advocacies. That is such a great honor. The International Coral Reef Initiative (IRCI) launches the Green Fins 2018 International Year of the Reef campaign. 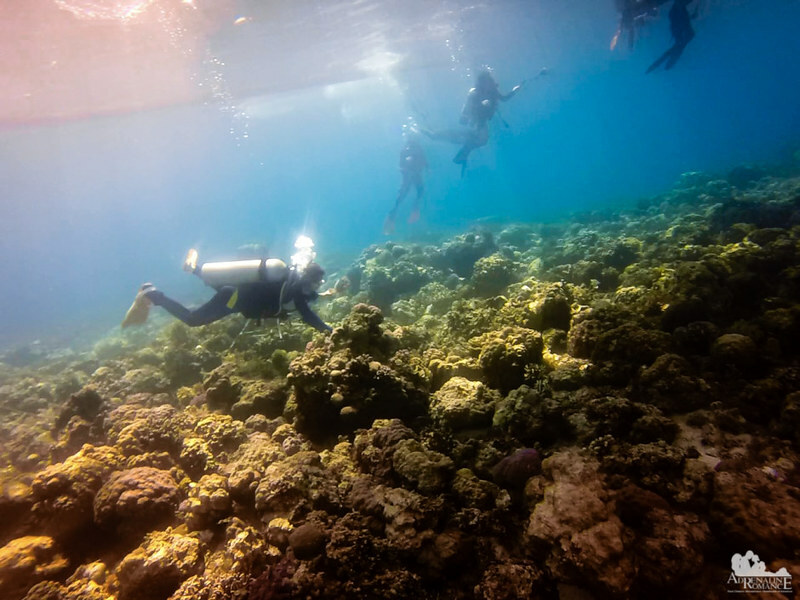 The campaign capitalizes on social media to promote sustainable or even zero-impact diving practices, introduce practical solutions to address reef threats, and encourage stakeholders to take action to save our coral reefs. Adrenaline Romance is proud to be part of the Green Fins IYOR 2018 campaign. Thank you! Protecting the environment is one of our advocacies. Thank you! We need to protect our marine environment. A healthy ocean means a healthy planet. Thank you very much, Hana. We will definitely do our part in saving our oceans. 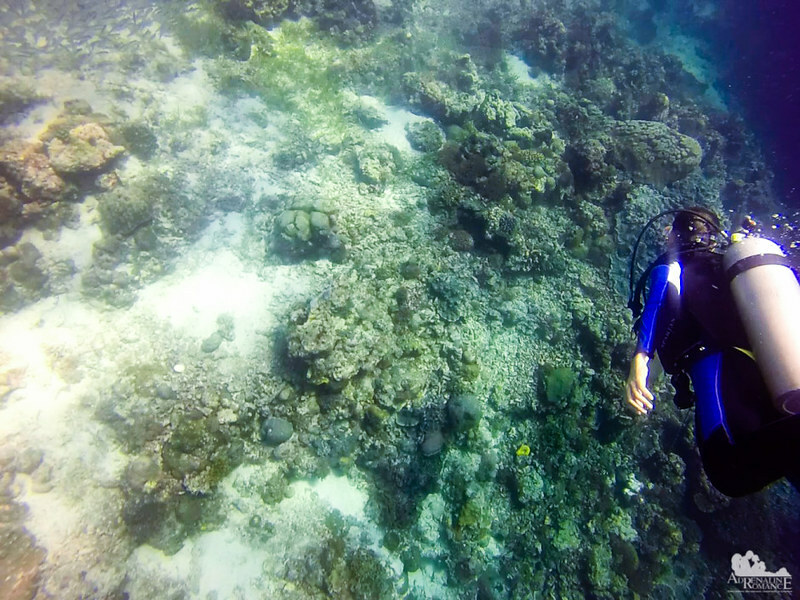 Diving in this piece of paradise seems exceptional and an unforgettable experience. Protecting the environment is an awesome job! Thank you! We do hope that boatmen, locals, and other stakeholders of this paradise will exercise more responsibility. What an awesome program! I too grew up close to the ocean and feel the pains that pollution is causing to the ecosystem. I love that companies like this exist and help try to educate others. Even though you were only able to gather a few small bags of trash, it’s a good thing that there wasn’t more! Totally support this. Cant believe how much plastic is in our oceans. We need to save our oceans! Right behind you! That’s right. Ecosystems are facing huge problems right now—global warming, acidification, etc. We don’t need pollution to add to that problem. That’s right. That’s why one of the long-term/continuous objective of Adrenaline Romance is to share knowledge and inform our readers about marine life, mountains, caves, etc. As they learn to understand and appreciate the beauty of Mother Nature, they will develop a sense to preserve and protect it. This is an excellent, excellent read! I live all the way in cold Europe, but watch intently how we’re slowly destroying our oceans. It’s a cause I feel so passionately about, especially when you see the damage to the sealife and the underwater plants too. Keep up the great work, and will share this post! Thank you very much for the share. Yes, it is very important that we keep our oceans healthy. A healthy ocean means a healthy planet. 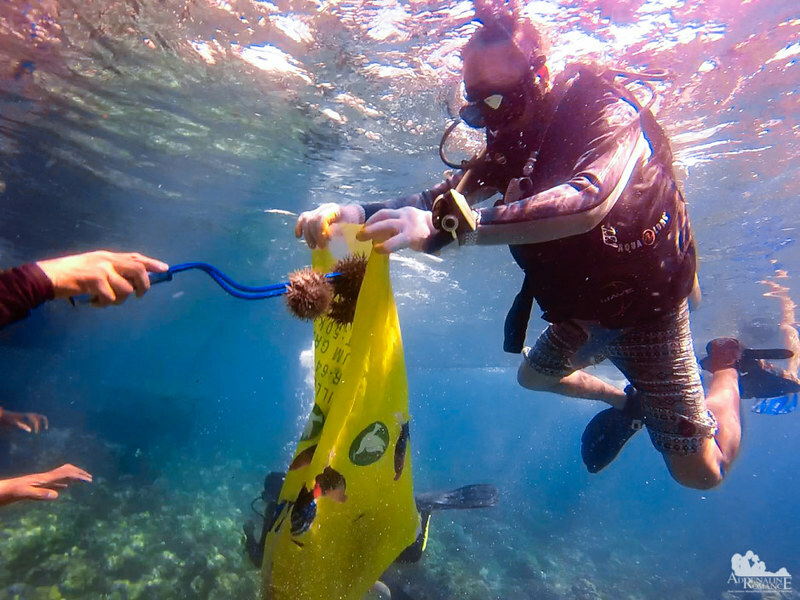 Thank you for taking part to help clean the underwater world. And it’s good to read that you only came with 2 half-filled plastic bags. Keep up the good work! I am so glad to see activities like this happening. And you are doing a real great job being a part of this drive. We human are really deprecating the environment at a higher rate than we are repairing the damage. Thanks for spreading the awareness by writing about it. Thank you. One of the ways which we can help is to share our knowledge through this blog. If our readers develop a love for Mother Nature because they enjoy reading about it, then it is more likely that they will protect the things that they enjoy or know about. This is such an important topic! I don’t scuba, but we live close to water in California and love snorkling, so we are always worrying about the state of the ocean. Thanks for participating the program and making awareness on this issue. What an incredible experience! Thank you so much for the personal touch you put on your explanations. You’ve inspired me to look into causes like this both closer to home and whenever I travel. Thank you! Everyone of us has an important role in preserving our environment.